Trim off a few asparagus tops and put aside for garnish. Coarsely chop asparagus and onions and set aside. Melt butter in a large stock pot. Add asparagus, except for the tops for garnish, and onion and saute for 7 to 10 minutes or until tender. Add stock and bring to a boil. Reduce heat and simmer for 20 minutes or until vegetables are tender. Once soup is done simmering, process through a food mill. Return processed soup to the large pot. Add the milk and heat thoroughly over medium heat. Add salt and pepper and adjust seasoning to taste. 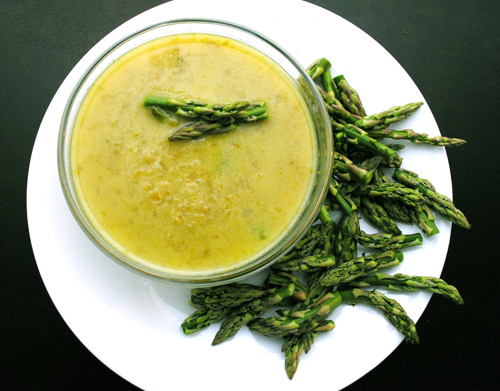 Serve soup warm and garnish with asparagus tops. Serve with fresh Croutons if desired. I agree, the picture is beautiful!